The Maungatautari Ecological District has less than 10 per cent of its native vegetation remaining. Before our farm was cleared, it would have consisted of rimu–tawa forest on the flat and gently sloping areas, tōtara forest on gully slopes, and kahikatea forest throughout its gully basins. There’s no denying that, for about a century, marginal land has been marginalised in New Zealand. Back in July 2015, we started to rebuild the wetlands on our farm. 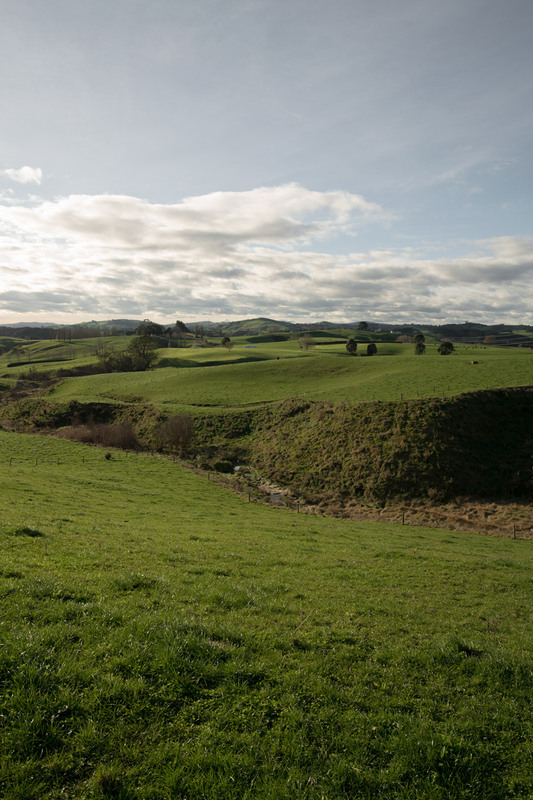 With the help of an ecologist and The Waikato River Authority, we prioritised the tasks and made a plan to increase the water quality at two exits. 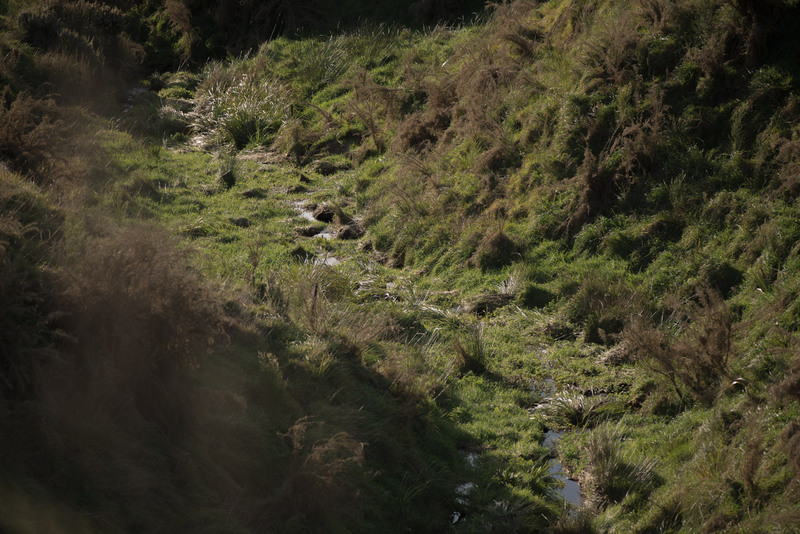 Wetlands are almost ubiquitous in the gully floors throughout the farm, and there are perched seeps and springs higher up the gully slopes. For just on 18 months now, plants in Gully 3 have been in the ground. They’ve gone from wisps of promise, to competing with the scraggly grass and weeds, to rising above the Scotch thistle squatters. We’ve watched the mānuka flower, seed and flower some more. The flaxes take off at a rate of knots, then slow, and the other tea-trees – with the delicate, apple-red flowers – come and go. We’ve heard birds larking about, darting from big tree to small tree and swooping in on the cold stream. It’s taken a decent amount of dedication and has by no means been easy. With the help of Robert and his team at Native Awa, we’ve ‘released’ the plants, which means stamping down the weeds around their trunks several times, and had to stake up the odd one that needed a helping hand. Fortunately, we’ve had two wet summers, so the ground and the weeds have been holding enough moisture for the young native trees and shrubs. In July, we began to develop a wedge-shaped area in the northern catchment of the farm. It was overrun with blackberry and was mulched, to allow easy passage. A month later, kids from the local Hora Hora School helped us to dig and gently place the water-loving plants – as well as beautifully painting and naming about a dozen bird boxes that we attached to existing trees. The area floods a lot in winter and the soil is spongy, so it needed a selection of species that don’t mind their feet getting wet, such as kahikatea, ribbonwood, mingimingi, cabbage tree and flax. August saw us extend Gully 3 to the north and south. The northern area already has the odd cabbage tree, kahikatea, tōtara and ribbonwood that Mum planted about a decade ago, as well as tea-tree that’s grown of its own volition. After some work on the steep gully slope, riparian and wetland areas, the shoots are currently weaving their way through the weeds, towards the sunlight. The rebuilding of Gully 3 and the wedge-shaped passage on the northern side are decisive steps in the right direction. There’s still a lot of work to be done reestablishing and repairing what’s been lost. But, for now, we can unequivocally say that the water leaving the farm is better than it was when it entered it.